Even when the main story appeared to conclude a decade ago with At World's End, Disney were of course never going to bring their Pirates of the Caribbean franchise to a close considering it's bankable potential. 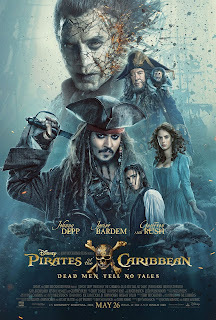 With On Stranger Tides receiving fairly unwelcome reviews but still hitting big at the box office, a sequel was all but likely - and after many delays and complications during production, the newest installment is finally here; and, to be honest, I'd hope it's the last. The infamous Jack Sparrow (Johnny Depp) finds himself a washed up failure following the loss of his own ship and his unsatisfied crew, and also the target for the malicious Captain Salazar (Javier Bardem), an undead pirate seeking revenge for Sparrow's actions against him many years prior. Tangled in with this is Henry Turner (Brenton Thwaites), son of Will Turner (Orlando Bloom), who seeks Jack's assistance to help free his father from the curse of the Flying Dutchman - all linked the mythical trident of Poseidon, which Salazar also seeks to lift his own curse. I've always loved this series even when it's hard to defend many of it's flaws. However, this latest installment is hard to defend in almost every aspect, from it's writing to it's acting to it's obsession with noisy set pieces: a flaw that has admittedly plagued the series on several occasions and was especially apparent in the previous entry, On Stranger Tides. As thrilling as the set pieces can be and as stunning as the visual effects are, they often find themselves popping up with little justification other than to inject some more excitement back into an otherwise boring story. The end result is a series of visual treats but ones that lack any real context and can be serious hell on your ears. In terms of plot, it's not unreasonable to say it's virtually non-existent; Javier Bardem gives it his all with Salazar, who has lots of potential considering Bardem's talent and his creepy visual design, but his lack of development and lengthy absences at random moments render him mostly forgettable. Nearly an hour in, I still found myself struggling to understand the meat of the story; the film instead seemed bent on delivering a number of goofy action scenes and mixing in tons of random characters into a messy, underwritten plot that clearly was not refined enough to be stretched out to such a bloated run time. Another key element to the story is of course the aforementioned trident of Poseidon, something that initially seems to hold major importance, but eventually serves as no more than a generic magical MacGuffin and the product of lazy, contrived writing. Jack Sparrow has always had his comedic charms, and it's of course one of his most loveable traits. Here, he finds himself as little more than an overly brainless comic relief, sitting on the back burner during many key scenes and acting as little more than a source of repetitive, drunken humour. Depp has virtually no compelling content to work with, but even his performance lacks the energy of his previous efforts, making the character generally unlikeable and irritating from start to finish. Mixed in with his obnoxiousness is the mediocre acting of Brenton Thwaites and Kaya Scodelario; both of whom portray their key roles with little interest and passion. We also have yet another forced inclusion of Geoffrey Rush as Barbossa, a character who feels completely unnecessary and poorly mixed in to an already unfocused story. I see even the most passionate fans of the series being letdown by this boring slog of a blockbuster, and it now seems to time to either finally retire the franchise or have a long think on the direction of it's future.